Efficient and fast content delivery. Unlimited public and private "beta" branches, allowing multiple builds to be tested. Simple web-based management of builds - push out a new build or rollback to a previous build with just a few clicks. Ability to see the update size of a build before setting it live. Ability to share content between multiple applications. Ability to build installer discs from public or beta content. Games/apps stay available offline even after an update download has been started. All content is always encrypted, and non-active versions are not visible to customers. A SteamPipe Local Content Server which can be used during development. NOTE: There are a few concepts which are integral to SteamPipe, before getting started you should be familiar with all of the concepts outlined in the Applications documentation. Having even a basic understanding of how these pieces fit together will be very useful when uploading your product to Steam. This tutorial introduces SteamPipe and steps through building a sample application for Steam via the Steamworks tools. This tutorial walks you through adding new platforms and languages to your game by adding depots to your app. SteamPipe uses the HTTP protocol for content delivery. Since downloads are regular web traffic, any third-party HTTP cache between the customer and Steam servers will increase download speed. Content can be hosted by external CDN providers, which can be easily added to our content network. Most consumer firewalls allow HTTP traffic and won't block downloads. SteamPipe has an efficient patching algorithm based on binary deltas, only changing the modified portions of existing content files. When this content is updated, only these deltas need be sent. This means both developer and user transfers are smaller and faster. Most partners will find that using a SteamPipe Local Content Server not necessary since they can efficiently patch builds on private branches. Before you can create any builds on Steam, you must have a Steam account in your Steamworks account with the "Edit App Metadata" and "Publish App Changes To Steam" permissions granted. For security reasons it's recommended that you have a dedicated build account with just those permissions, you may create a new Steam account for this purpose at https://store.steampowered.com/join. Go to the General Installation Settings page for your app. Define at least one launch option (the path and optionally, any arguments required to launch the game). Hover over the (?) to learn more about each field. The example below shows 4 launch options, 2 for Windows and 1 each for MacOS and Linux. Launch option 3 will only be shown on Windows if the user also owns the DLC specified. Go to the Depots page and add depots as needed for this app. By default, a depot may already be configured for your application. Click the default depot and change the name of the depot to a proper and recognizable name (such as "Base Content" or "Windows Content"). Leave the language set to [All language] unless this is a language-specific depot. Leave the OS set to [All OSes] unless this is an OS-specific depot (if the app is all-in-one, or is just PC or just Mac, it should be left to [All OSes]. Only specify for OS-specific game depots. Click Add New Depot to create additional depots. Click Save Changes to save any changes made. Once you are done defining your depots, publish the changes that you have made from the Publish page. Your newly defined depots will need to be included in a package to grant you ownership of them. Each game on Steam should have a Developer Comp package which is automatically granted to the accounts listed within your publisher group. You can add the new depots to that package (and/or other packages that should have these depots) on the Associated Packages & DLC page. Note: If your executable is in a sub-folder of the main installation folder, add the sub-folder name in the Executable field. Don't use leading slashes or dots. Download and unzip the latest version of the Steamworks SDK on the machine you will be uploading builds on. 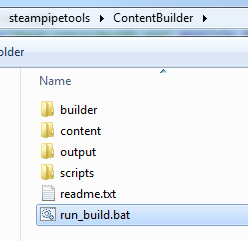 The SteamPipe tools can be found within the SDK in the tools folder which contains 2 relevant sub-directories. builder - This directory initially contains just steamcmd.exe which is the command line version of Steam. builder_linux - The linux version of steamcmd. builder_osx - The macOS version of steamcmd. content - This directory contains all game files that will be built into depots. output - This directory will be the location for build logs, chunk cache, and intermediate output. NOTE: This folder can be deleted or emptied at any time, but after it's deleted, the next upload time will take longer. scripts - This directory is where you'll place all of your build scripts for building your game depots. It's recommended that you run steamcmd.exe directly in the builder folder for your platform once to bootstrap your build system. This should populate your builder directory with all the files it needs to build depots. The ContentServer directory contains the tools for running your own SteamPipe Local Content Server if you choose to do so. You can then follow the rest of this documentation (substituting paths as appropriate) to create depot and app config files for uploading your content to Steam. To upload your app with SteamPipe, you must create scripts which describe your build and each depot that will be included in it. There are simple example scripts in the ContentBuilder\scripts folder for an app with one depot. NOTE: You can name these scripts what ever you want, but we use the names app_build_<AppID> and depot_build_<AppID> for consistency. If you know that you'll be building apps on this machine, it might be a good idea to create sub-directories in your scripts directory for each application, to help organize each application's build scripts. If you're running on Windows and would prefer a GUI tool to help create these config files and upload your builds you can use the SteamPipeGUI which is available in the tools folder of the Steamworks SDK. Included in the zip are additional instructions to get you started. If you choose to use the GUI tool then reading the following sections is still recommended to help you become more familiar with how the SteamPipe system works. First create a depot build script for each depot you are wanting to upload. Start by duplicating the depot_build_1001.vdf script and renaming it with the depot ID that it will be uploading. NOTE: Setting a "ContentRoot" in the depot build script will override the "ContentRoot" in the app build script. After setting up your Depot build scripts you will need an App build script which describes the details of the build. Start by duplicating the app_build_1000.vdf script and renaming it with the app ID that it will be building. Preview - This type of build only outputs logs and a file manifest. Building preview builds is a good way to iterate on your upload scripts. Local - Builds for the SteamPipe Local Content Server. LCS builds upload to your own LCS and allow you to test the installation of your game using the Steam client. SteamPipe - SteamPipe builds result in your depots actually being uploaded to Steam. This is always safe to do, even for games that are already released, as you will need to set it public before customers can download it. NOTE: Your first attempt at running a build may fail due to Steam Guard. If the logon fails due to Steam Guard, check your email for the Steam Guard code, and run steamcmd as: steamcmd.exe "set_steam_guard_code <code>", and try again. 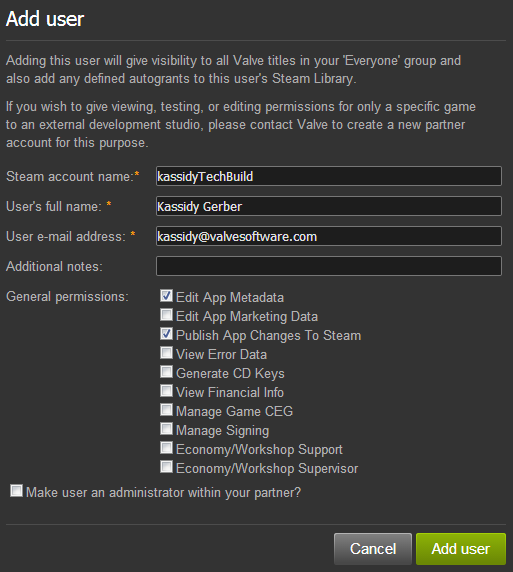 After logging in with Steam Guard once, a sentry file is used to verify the login is genuine. After you run run_build.bat, your build output should be in the directory specified in your build script file. If the preview build produces the expected manifest, run the build again with "preview" "0" in your app build script. Steamcmd.exe is logging into the Steam backend using the given builder Steam account. The app build start is registered with the MDS (Master Depot Server), which will ensure the user has the proper privileges to modify this app. For each depot included in the app build, a file list is generated based on the files in the content folder and the filter rules defined in depot build config file. Each file is scanned and divided into small chunks of about 1MB. If the depot has been built before, this partitioning will preserve as many of the unchanged chunks as possible. New file chunks are compressed, encrypted, and then uploaded to the MDS. A final manifest is generated for this depot version; each manifest is identified by a unique 64-bit manifest ID. Once all depots have been processed, the MDS finishes this app build and assigns it a global buildID. After the build is done, there may be *.csm and *.csd files in the build ouput folder. These are temporary and can be deleted, but they speed up subsequent build times. After your app releases to customers, your customers will be receiving the build marked as the Default build. When uploading a new build it's always a good idea to test it before shipping it to your customers, for more information on how to successfully do this see Testing On Steam. There can be multiple file mappings that add files to the depot. They should be listed first. Files or subfolders can be excluded with filter expressions. Steam install scripts can be marked during the build process so the Steam client knows to run them for any application which mounts the Depot. Files or folders can be remapped, so sub-folders in the content folder can be mapped to anywhere in the depot. userconfig - This file is modified by the user or game. It cannot be overridden by an update, and it won't trigger a verification error if it's different from the previous version of the file. readonly - This file will be marked as read-only for the client file system. hidden - This file will be marked as hidden for the client file system. executable - This is an executable file (for OS X only). If your build wasn't successful, you should look in your output directory for error information, not the console where the build script was run. Most error information can be found in the *.log files. "app_status [appid]" - Shows the current state of the app on this client. "app_info_print [appid]" - Shows the current Steamworks configuration for this game (depots, launch options, etc.). "app_config_print [appid]" - Shows the current user configuration for this game (current language, install directory, etc.). file "logs\content_log.txt" - Lists all logged Oxcart operations and errors. file "steamapps\appmanifest_[appid].acf" - Shows the current install state of this app (KeyValues). The old Steam content system would patch updates on a file level, which meant that if a single byte in a file changed, the entire new file would be downloaded by all users. This was especially inefficient if the game used pack files, which are collections of game content files in a single big file. Pack files can easily exceed 1 GB, so updates often led to unnecessarily large downloads. A common way to avoid these large downloads was to add new pack files that overrode content of already shipped pack files. That worked for updates, but it hurt new users long-term, since they ended up downloading unused, already-patched content. The new content system fixes this problem by splitting each file into roughly 1-MB chunks. Each chunk is then compressed and encrypted before being distributed by the Steam content system. If the game content has large redundant parts, these chunks are reused and the user only has to download each repeated chunk once. However, the real strength of this system is building efficient update patches. While the system is building a patch, the new content is scanned for already known chunks. If it finds them, it reuses them. This means if you change or inject a few bytes in a big file, the user only has to download the changes. This works well in most cases, but there are still a few pitfalls that need to be avoided when designing the content layout of a game. Do not compress or encrypt your game data. This is already done for in-flight downloads and retail discs by the Steam content system. If you do it too, you will reduce the effectiveness of delta patching. If you package multiple data files in a single pack file, make sure that with each re-packaging, no unnecessary changes are made. One problematic practice is including the full name of the original source files on disk, because the names may change, depending on the build machine. Another bad pattern is including build time stamps for each file. If possible, always add new content to the end of your pack files and keep the order of existing files. Also, keep your pack file’s metadata (offset and sizes to individual files) in one place and don’t intersperse it with content files. Use a binary diff’ing tool like BeyondCompare to look at two builds of your pack files to make sure that hundreds of unwanted changes don’t show up. If you follow these rules you will minimize patch sizes and only new content will need to be downloaded. Your customers will thank you for that and you will be able to increase the quality of your product by shipping more updates. To build retail install disc for SteamPipe games, you must first setup a build project file. Create a new folder where the retail disc images will be written to, e.g., "D:\retail_disks". Only depots in the included_depots sections are added; there is no exclude section anymore. You can use Steam.exe (with the -dev and -console command-line parameters) or steamcmd.exe to build installer images. In both cases, use the "build_installer" command. Log on with a Steam account that owns the game and all depots you want to put on the retail disc. Otherwise, the account doesn't need special rights, so anyone can build installer discs. If you use Steam.exe, stop all other downloads. The build can take a while since all depots are re-downloaded the first time. The spew refers to 'Backup' since 'Retail install Disk' and local game backups are basically the same. Once you see "Backup finished for AppID...", the install disk images are ready. You can find more details about the backup build in logs\backup_log.txt. There are new folders (Disk_1, Disk_2, and so on) in "D:\retail_disks", each not bigger than 640 MB, as specified with "disk_size_mb". Each disk folder contains a "sku.sis" file and a .csd and .csm for each depot. Bigger depots span across multiple disks. All retail install disk content is always encrypted (unlike local game backup files). Copy the SDK GM setup files (setup.exe, setup.ini, etc.) into the folder of your first disk and the retail disc installer is complete. When creating a GM for OSX, be sure to open the goldmaster/disk_assets/SteamRetailInstaller.dmg image on a Mac. Then take the app that is in there and copy it to the root of your media. You will probably want to change the name of the install app, brand the icon and decorate the window to only show the installer. When creating a multi-disc GM for OSX, be sure the volume name for each disc matches. The volume name becomes part of the mount path, and if the names don't match the installer won't be able to find the next disc. In some circumstances, you may wish to create a retail installer that includes your DLC packages. In such cases, the process to create the installer requires only a few changes. In "sku_goldmaster.txt", include the DLC AppIDs under the "included_depots" section. Once you have run the "build_installer" process, find the generated sku.sis file for the installer and open it with a text editor. This will ensure that Steam checks for ownership of the DLC and prompt the user for a key if the DLC is not owned by the account that they are logging into on Steam. To build a GM containing multiple Steam Pipe apps. Build each app installer one by one but point them all to the same output folder. Each build will merge itself with the already existing install image. See Customizing a gold master for more details on customizing your retail install disk. By default, all content is always encrypted, on all retail discs and on all content servers. Switching a game to preload mode means owners can download the content, but it stays encrypted on the users' disk and can't be played. Once the game becomes officially released, Steam will decrypt the preloaded content and the user can play the game. Shipping retail discs with product keys before the game is actually available (0-day piracy). Games that run a pre-purchase and are larger than 20GBs in size. Please submit a ticket to Steam Publishing if you believe your game requires preloading. DLC is built as a depot of the base game. See the Downloadable Content (DLC) documentation for more information. Check the email associated with the account you are trying to log on with and look for an email from Steam Support. Copy the code from that email. Restart computer, modem, router, etc. Verify firewall settings. The new system requires port 80 (HTTP) and all other Steam ports, listed here. Temporarily disable local Anti-Virus or Spam-Blocker programs. Check the Steam download region under Settings->Downloads. It should match your location. Stop the download, uninstall, and reinstall the game (clear manifest caches). Exit Steam, delete the two folders appcache and depotcache in your Steam install folder. Try to set your Steam download region to some other location far away. This might work if a content server near you is serving bad data. My Mac and/or Linux Builds aren't installing any files. Why? Running steamcmd.exe results in the following error: "SteamUpdater: Error: Steam needs to be online to update. Please confirm your network connection and try again." Resolution: Go to Internet Options->Connections->Lan Settings and check Automatically detect settings. Running the app build results in the following error: "ERROR! Failed 'DepotBuild for scriptname.vdf' - status = 6." Account does not have permissions for the app. Check that the app ID is correct in the app_build.vdf. Check that the build account has proper permissions to the app ID. Steamcmd cannot find the depot contents. Check that the "contentroot" value in the app_build script is a valid path relative to the location of the script file. Check that the "LocalPath" value in the depot_build script is a valid path relative to the path in the app_build script. Check that the path contains actual content. Running the app build results in the following error: "ERROR! Failed to get application info for app NNNNN (check login and subscription)"
This means that Steam can't retrieve information about the app, either because it doesn't exist or the user doesn't have access to the app. Check that the NNNNN is the app ID you were assigned for the app. If it is a new app ID, check that the Steamworks app admin configuration has been published. New apps should have a Steam Pipe install directory on the config tab, a depot on the depot tab, and all changes published on the publish tab. If all of that looks right, make sure that your account owns the app ID. No build has been set live on the branch you're trying to install from. Resolution: Set your build live on a branch by going to https://partner.steamgames.com/apps/builds/<YourGameAppId>, and select that branch in the Steam client (as described here). Resolution: Verify the launch options on the Configuration tab in the app admin for your game https://partner.steamgames.com/apps/config/<YourGameAppId>. You don't own the Depot IDs that make up the game. Resolution: Make sure the necessary depots are added to the development subscription (See Editing packages for additional details). This is the CEG servers rejecting the request to CEG the exe. Check the release state on the game page. If it is not 'playable', you will need to request Steam keys that override the release state. This is the CEG servers failing to find a matching CEG exe. Double check that you have a working CEG executable on the CEG tab of your app admin. Click the 'status' button to make sure that it's propped. Use the 'find' command in steamcmd to search for any steamcmd command. It will do partial matching on the command name and it will list out the command syntax.